Applying out-of-band management in both data center and branch offices to ensure security, compliance while maintaining critical uptime. Deploying Uplogix in financial data centers and branch office networks not only brings the core values of lowering OPEX and improving service levels, but also improves security and regulatory compliance. Uplogix extends role-based management policies to network devices. Uplogix manages server and network device serial port access, applying policy to ensure sessions are properly closed. This helps eliminate the likelihood of inappropriate access. Authentication, Authorization and Access (AAA) is maintained by Uplogix even when the network is down, removing the potential for unaudited access to managed devices using “break glass” passwords with sweeping privileges. Audit functionality extends to all actions including warning dialogs and responses so it’s possible to know who, did what, and to what affect. 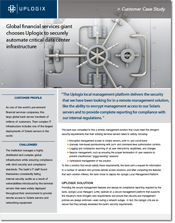 CASE STUDY | See how Uplogix improves security in one of the largest and most distributed financial networks. Combining secure out-of-band access with intelligent management features that automate support of our Solaris servers and networking devices made the product so compelling that we opted to replace existing traditional terminal servers with the Uplogix appliances. Mergers are common in the financial world, and often IT groups find themselves managing disparate financial networks. Uplogix integrates with various network devices and server platforms by tying the device’s command line interface into the Uplogix unified CLI framework. The unified common interface not only eliminates the need for administrators to remember individual device commands, but also makes automating common management tasks simpler. Devices not currently supported can be managed natively by using the device CLI. 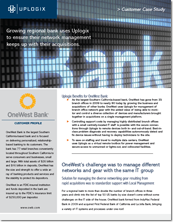 CASE STUDY | Uplogix simplifies management by serving as a single interface to diverse network gear that is a result of rapid expansions through acquisitions in the banking industry.